The Solid State Hard Drive is now a viable alternative to the traditional Hard Disk Drive (HDD) for home computer users. However, there are several factors I think you must take into consideration before deciding whether this type of hard drive is appropriate for you at this time. This article explains what a Solid State Hard Drive (SSD) is and how it differs from traditional Hard Drives. It also poses several scenarios to help you decide whether this type of HDD is right for you. What Is A Solid State Hard Drive? Why Should I Consider A Solid State Drive? A Solid State Hard Drive does not look too much different from a traditional Hard Drive for a desktop computer or laptop. They both do the same job of storing your data and the files that run your Operating System and programs. However, the technology that underpins them vastly differs, and therefore so do things like durability, performance, capacity and cost. Available for several years now, SSD technology is traditionally expensive and usually found in large data centre Servers. More recently, as costs decrease, Solid State Drives (or Flash Memory) have come into the home computer mainstream through Tablet technology such as the Apple iPad. 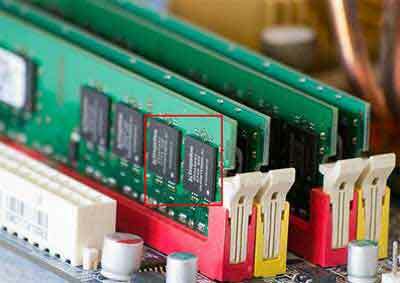 In tablet machines the inbuilt flash memory is embedded on the motherboard. In PC's and Laptops SSD's ultimately plug into the motherboard just like traditional hard drives. A Solid State Hard Drive is made up of RAM memory boards (Random Access Memory) as opposed to a traditional rotating disk platters. Like an old vinyl record the head/needle reads (and writes) your information to/from the tracks on the disk platter (you can't see these tracks but they are there, storing your magnetised data). Like an old record player the vinyl record (i.e. disk platter) must be spinning at the right speed for the data to be accessible. The image below illustrates the technical differences. Traditional RAM is volatile. This just means that the information stored on it e.g. your loaded programs and files, are not retained if your machine loses power. SSD RAM is non-volatile. This just means that information stored in it is not lost when your machine loses power i.e. just like a traditional hard drive. Solid State Hard Drives are reportedly more durable and better performers than traditional Hard Drives. However, they also hold less capacity and are more costly. What does that last paragraph actually mean? In this section we dissect this paragraph and look at each element in more detail. The fundamental differences in the technologies means Solid State Drives are more durable. This because more things can go wrong with a traditional hard drive due to the moving parts within them, including. These issues with traditional drives are not possible with the solid state versions. As there is no moving parts, the power required to run a Solid State Hard Drive is much less than a traditional hard disk. This makes then very attractive for inclusion in Laptops and other portable devices. The performance of a SSD is much better than a Hard Drive. There is a notable improvement in the time it takes to load the Operating System, Programs and Files. For Microsoft Windows using Sleep/Hibernation recovery time is much quicker. Installing software and game play is also enhanced. Some SSD's include encryption which means your data is protected if your machine is stolen or misplaced. The image below highlights the difference between a hard drive that spins at 5400 Revolutions Per Minute (RPM) and a SSD. Although today's hard drives spin at 7200 RPM and higher, the Peak Date Rate figures i.e. the maximum data rate (Read/Write) of the drive, in MegaBytes per second (MBps), differ greatly. Solid State Drives can now run 24/7, have inbuilt protection against power surges and can transfer data up to 6Gbit/s. However these are usually enterprise class SSD's and can cost up to £1000! The difference in performance is because of the way the RAM boards work on Solid State Drives. The bigger the drive, the better the performance too. The reason for this is very technical but basically the more 'NAND chips' (RAM boards) your SSD has, the better the performance. SSD's also come with their own processor. Combined with RAM boards, they can produce high Input/Output (I/O) rates through sequential Read/Write capabilities. 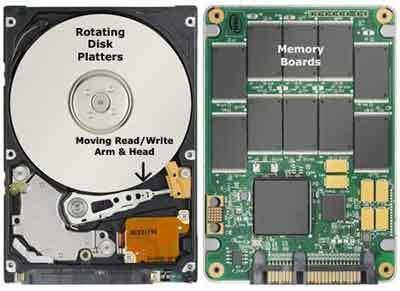 This just means solid state hard drives can read and write information at the same time, very quickly (up to 2.7GB/s). Input/Output refers to the data that transfers to or from your computer or peripherals such as a printer, for example. Combined, the traditional hard disks I/O rate is much lower, making them slower than solid state drives. All hard drives, including solid state ones, slow down over time, and stop working too. Wear and Tear sees to this! With traditional HDD's you can improve performance by carrying out tasks such as defragmenting your drive, using utilities such as Defraggler. For Mac OSX users, software such a Trim Enabler (Opens New Window) cleans up your solid state drive and reports to improve performance and extend the life of your drive. It is worth noting at this point that SSD's still have a limited lifespan compared to traditional HDD's. Due to how the technology works, your SSD can only manage a fixed number of write commands. This just means the number of times you click the Save button. However, don't worry, for the average home computer user, this means your SSD will serve you in excess of 5 years before the RAM boards become unstable through wear and tear. In this time there is a high chance you will have already replaced your device with a new one anyway. Capacity is the size, in Gigabytes (GB) these days, of your hard drive. It determines how much you can install or save. Storage capacity was limited but is quickly gaining parity with traditional drives. Typically 256GB SSD's are provided with modern laptops. However there are SSD's with 1TB (Terabyte) capacity on the market. In terms of cost, SSD's are still more expensive. However, this cost is constantly falling, which means they are now a valid alternative for home computer users. Is the Solid State Hard Drive right for you? This is a question only you can answer. Consider how you and your family use your computer or laptop. What is more important, performance or capacity? If you are a gamer, impatient or generally like things to be done quickly, and you do not store much data, then a solid state hard drive is a serious option for you, assuming you agree with the cost. If you are not too concerned about speed, but are into digital photography, making videos and other multimedia tasks, a traditional hard drive is for you. Consider whether you really need a large amount of local storage space, especially with cloud services available. If you decide to change your hard drive, and your machine is relatively new, check with your supplier to ensure you do not invalidate the warranty agreement. Finally here is a comprehensive review of the differences between SSD's and traditional hard drives from PC Mag (Opens New Window). Worth a read!